IGANGA – Ten people are confirmed to have died when two coasters collided head-on at Maga-Maga Town on the Iganga-Jinja Highway on Sunday night. According to the Busoga East region Police spokesman, Mr James Mubi, the accident occurred when the driver of coaster UAT 672Q tried to overtake at a wrong place. 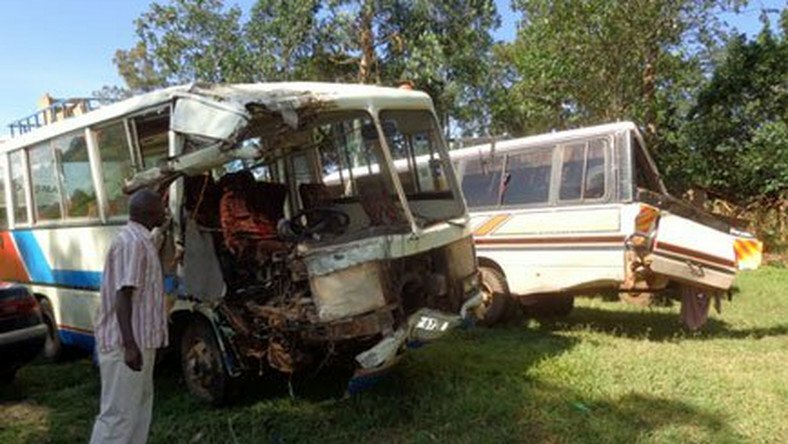 “The driver of that coaster which was coming from Mukono was trying to overtake at a wrong place and ended up having a head-on collision with another coaster which was heading to Kampala,” Mr Mubi said. The injured were rushed to Iganga, Jinja and Mulago hospitals in critical condition, while most of the deceased were residents of Iganga who were returning from Mukono where they had gone to worship at Pastor Kakande’s Church. Mr Sam Obira, an official at Iganga hospital, said among the deceased were five women, two men and three children aged six years and below. He identified some of the deceased as Jessica Nabirye, Sulaina Namugabo, Sarah Nakilija, Christine Asio, Muzafaru Ikoba and Godfrey Tigawalana, while the identities of a woman and the children remained unknown by press time. Ms Aidha Nangobi, a relative to one of the victims (Jessica Nabirye), said the deceased and others were picked up on Saturday to go for worship in Mukono. “Their Church leaders in Mukono have always sent a coaster to pick them up in a group for worship and they died on their way back to Iganga,” Ms Nangobi said. At Iganga hospital mortuary where the dead bodies were taken, a sombre mood hovered over the facility. Mr Mubi further warned motorists against reckless driving and asked them to always follow traffic laws to avoid more accidents. “Our people died as a result of reckless driving. If he didn’t try to overtake at a wrong place, perhaps the accident would not have happened,” he said.